Paolo Nutini’s Sunny Side Up has been whipping around my iPod for the whole Christmas holiday. It’s a barnstormer; Nutini completely does away with the pillock-pop of his over-produced first album and just tears the studio apart. It’s written about his time touring, and it would be a spectacularly narrow album were it not for his musical eclecticism. He samples a huge variety of genres, from swing blues (Pencil Full of Lead), to scottish folk (Chamber Music) to first-wave ska (10/10). But he doesn’t just try to imitate them; he gives them all the Nutini treatment, ramps up the energy levels, and commits them to disc. But why bother sampling all these different genres? Surely, great artists can pull brilliant new arrangements out of the air? Surely, they’d just be suddenly inspired, jump out of the bath, and run naked down the street clutching a new chord progression? Oh, no. Good Artists Copy, Great Artists Steal. The reason that it’s such a good idea to nick what’s gone before is that it works. You wouldn’t launch a product without market research, would you? Bob Dylan stole from Woody Guthrie. The Rolling Stones stole from Chuck Berry. And those guys were working in times when music was expensive. We’re the lucky generation. We’ve got Spotify, iTunes, YouTube… an almost limitless supply of free/cheap music at our disposal, going right back to the 1910’s. So why would you stick in the noughties? I know that plucking random artists out of the air can be a thankless task, so I’ll show you what I use to get ideas from the past. http://www.allmusic.com/ is a tremendously under-used service. It’s the Wikipedia of music, with detailed reviews of artists, albums, and songs. But here’s the clever bit. Say you use the genre bar on the homepage, and go into Rap. You can then click on, say, Jazz-Rap (which is awesome, by the way) and you get a detailed biography of what the Jazz-Rap movement was all about. Then, you click on Top Artists. This is the cool bit. 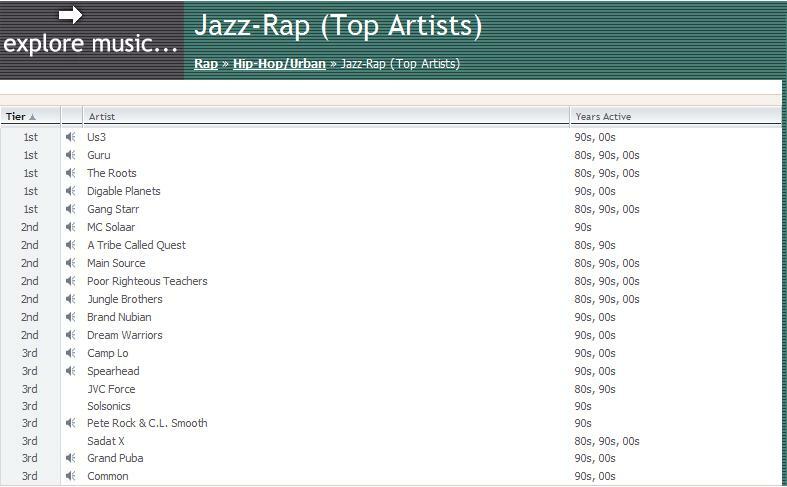 Not only do you get a detailed list of everyone who’s ever made Jazz-Rap, but you get a ranking of how representative they are of this genre. Perfick. So, next time you’re stuck for ideas, head over to allmusic.com, put on your musical balaclava, and get ready to rob!